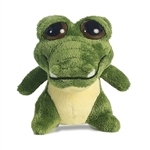 Much like a popular high school quarterback, these stuffed animals have dreamy eyes! Aurora's Dreamy Eyes stuffed animals are much better at throwing from the pocket though, assuming throwing from the pocket means having big eyes and being cute and cuddly, which it doesn't. Details. Dreamy Eyes plush animals don't worry about details. These big-eyed stuffed animals have droopy eyelids, happy faces, and carefree personalities. Some people say that you shouldn't walk through life half asleep but these stuffed animals are too sleepy to listen. Too sleepy and too cute to care anyway. Available in many different species, from farm animals to jungle animals and even mythical creatures, Aurora's Dreamy Eyes stuffed animals are wonderful additions to any plush collection. Several of the Dreamy Eyes animals have shiny accents that add a little extra excitement to their appearances. Just in case a purple stuffed giraffe with big eyes wasn't exciting enough, Aurora added shiny purple hooves to Glimmer to ensure that it was as fun as humanly, or more fittingly, giraffely possible. Is giraffely a word? No. Again, details. If you ask a Dreamy Eyes stuffed animal it will tell you that details are like regular sized eyes, there's no need to pay attention to them! You'll want to pay lots of attention to the plush animals on the following pages though. There's so many to see that you won't want to overlook a single one. Guess who never overlooks anything. Give up? A Dreamy Eyes stuffed animal by Aurora. That's who!